Just launched yesterday, Sunwing is offering savings of up to 40% on some of their most popular top-rated adults only resorts. Packed with travel inspiration to suit all tastes and budgets, the sale provides parents the perfect opportunity to steal away for some 'me time' before the school summer break arrives, and rewards couples with the chance to luxuriate in a tranquil beach haven now that spring break revelling is at an end. However beach lovers will have to move fast as these savings are only available until April 7th. In addition, as Canada's #1 for adult vacations, when travellers choose to book with Sunwing, they'll also enjoy a host of indulgent extras to make their vacation budget go further depending on the resort they select – from spa discounts to unlimited à la carte dining. Those in search of romance and relaxation in an incomparable Caribbean setting are sure to be tempted by the savings offered at Hideaway at Royalton Negril. Jamaica's newest adults only property, this serene oasis within Royalton Negril offers guests an exclusive restaurant, their own pool, bar and private beachfront. Vacationers can also take advantage of the extensive facilities within the wider resort, including 11 restaurants, complimentary non-motorized water sports, varied bars and lounges serving premium drinks, on-site spa and fitness centre. 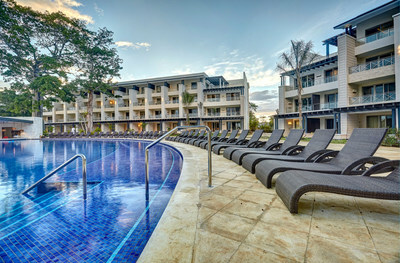 Couples keen to stay active during their beach getaway could opt for CHIC Punta Cana. Set on a pristine stretch of Uvero Alto Beach, this stylish adults only resort provides travellers with a host of ways to stay in shape. The state of the art fitness centre offers a wide range of fitness classes from Zumba to circuit training. Vacationers can also enjoy a game of tennis or try kayaking; just one of the many non-motorized water sports that form part of the generous all inclusive package. Those in search of a beach escape for a steal will love the savings offered at Sanctuary at Grand Memories Santa Maria in Cuba. Located in Cayo Santa Maria, famed for its powder white sands and translucent turquoise seas, this is the perfect place to unwind. Suites benefit from butler service and an abundance of indulgent extras such as in-room liquor dispensers. In addition to enjoying their own dedicated à la carte restaurant and bar, guests can also take advantage of exchange privileges with two neighbouring resorts; offering a wide range of dining experiences and bars to choose from. All packages include return flights on Sunwing Airlines where passengers can sit back and relax while on board, with award-winning inflight service that includes a sparkling wine toast, complimentary non-alcoholic beverage service and buy on board selection of light meals and snacks with choices inspired by Food Network Canada Celebrity Chef, Lynn Crawford. Passengers also benefit from a generous complimentary 23kg checked luggage allowance. As Canada's #1 to the sun and North America's largest vertically integrated travel company, Sunwing has more flights to the south than any other leisure carrier with convenient direct service from over 34 airports across Canada to over 50 popular sun destinations. This scale enables Sunwing to negotiate the best deals and exclusive offers at all of the top-rated resorts across the Caribbean, Mexico, and Central America. Renowned for its award-winning service, Sunwing is consistently voted the #1 leisure airline by travel agents and is the perennial winner of the Consumer Choice Award. Customers can look forward to starting their vacation off in style with award-winning inflight service, which features a complimentary glass of sparkling wine, tea and coffee and non-alcoholic beverage service; together with a buy on board menu of light meals and snacks (including kids' choices) inspired by Food Network Canada Celebrity Chef, Lynn Crawford. Sunwing customers also benefit from the assistance of the company's own knowledgeable destination representatives, who greet them upon arrival and support them throughout their vacation journey.